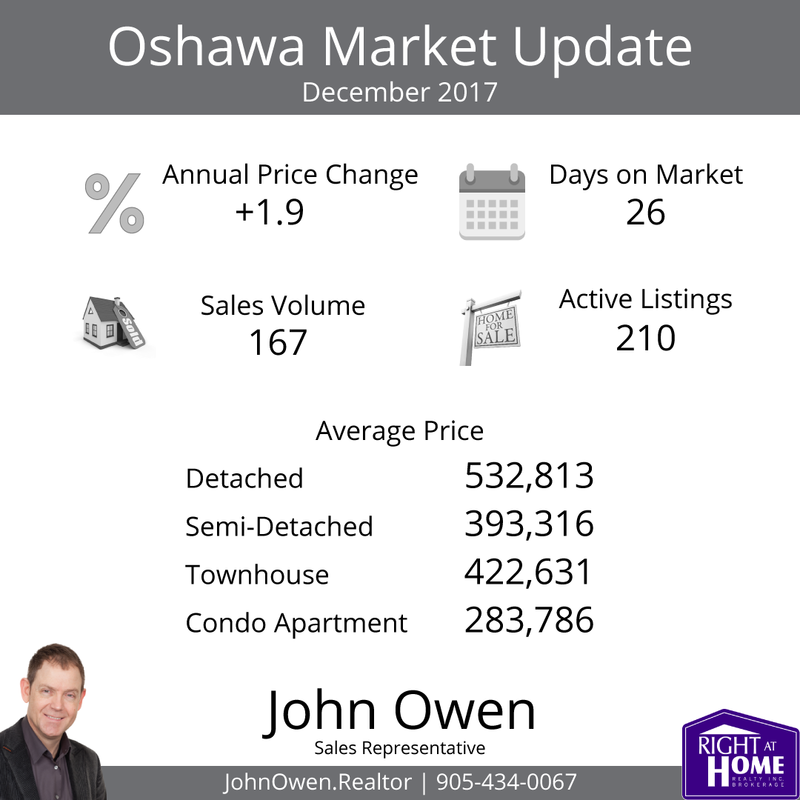 Oshawa's real estate market finished 2017 with a much more balanced feel to it than we have experienced over the last couple of years. Prices made a 1.9% average annual price increase in December 2017. Average prices for all of TREB made a comeback from August's low, as shown in the following chart (red line), though the numbers in November and December are off from October. 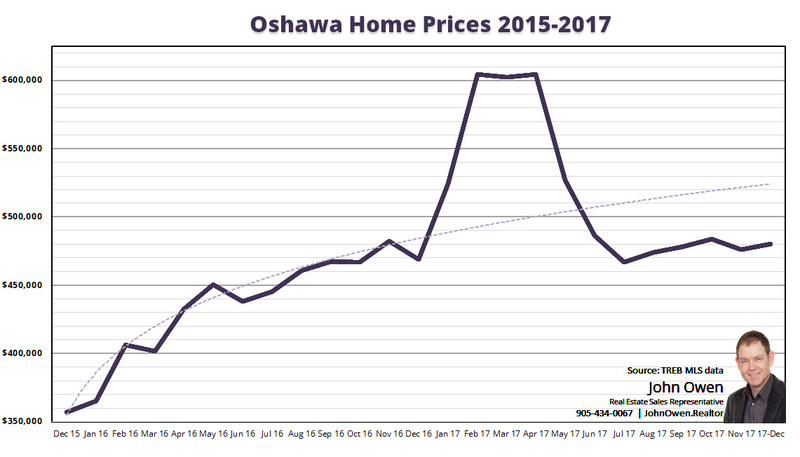 Most of the areas in Durham Region (blue line) and Oshawa (purple) have increased since their low point in July, with varying performance since then. The Toronto Real Estate Board's (TREB) latest market statistics show the average Oshawa property at $480,434 - up from last year's 471,349, and also up from last month's 475,938. Sales volume was also up - 8.4% with 167 units sold versus 154 last December. The increase is an encouraging sign for local demand, as sales volume had been lower than last year for some time. The average selling price of homes in the GTA this December was $735,021. This represents a 0.6% increase since 2016, but is down since July (746,218). Sales volume was down 7.6%. The difference between TREB overall and Oshawa suggests that buyers seeking value are looking, and buying, in Oshawa over other areas that are seeing dips in volume and price. Active listings within the board increased 172.4%, which shows a shift in market fundamentals. The jump in inventory is helping to make the market more balanced - more inventory means less bidding wars as supply rises. In Oshawa, the increase was 180% with 210 active listings over just 75 last year. This helps to explain why prices dropped from spring levels. The increase still isn't enough to make it a buyer's market, though. The average property in Oshawa still sold for 98% of asking. That's still close to being on par with the entire GTA, and is partly due to Oshawa still having the lowest average prices in the market. While inventory levels did increase, the levels are still low. The current trend shows only 1.6 months of inventory. The MLS Home Price Index helps to normalize the statistics, by adjusting sales statistics to represent typical homes within MLS areas. When using these numbers, Oshawa showed a composite annual gain of 6.56%, compared to the TREB average of 7.19%. Inventory levels continue at moderate levels with 1.9 months of inventory on hand across the board. This means that a current sales levels, all of the property would be bought up in the GTA in 1.9 months (if no new listings were added). In Oshawa, there is 1.6 months inventory. The average listing in Oshawa spent 26 days on the market. The TREB average was 27 days.